Port Vale goalkeeper Sam Johnson has what it takes to play at the highest level and will not let the club down in the absence of number one Chris Neal, according to defender Adam Yates. 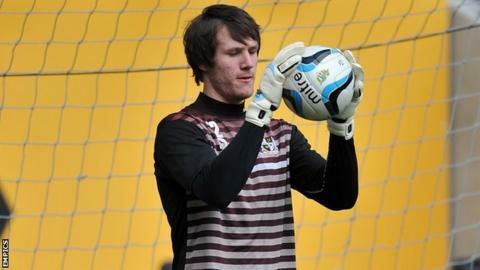 Johnson, 22, will start the season for the League One Valiants with Neal out with an ankle injury. "He's a young lad and we have to get behind him," Neal told BBC Radio Stoke. "He's an imposing figure, he makes good saves, his kicking's come on well and he can come in and do very well." Vale are still unsure how long Neal will be out of action for after he twisted his ankle in a pre-season game against Notts County last month. In 26 league and cup games, Sam Johnson has helped Vale to 10 wins, six draws and suffered 10 defeats. He had an unforgettable debut at Walsall in the Johnstone's Paint Trophy in October 2012 when he made a string of key saves before helping Vale squeeze through 6-5 on penalties - by scoring the winning spot-kick. Johnson, who had a month's loan with non-league Alfreton last season, has deputised for Neal before when the Vale number one suffered a similar ankle problem in March 2014. In total, Johnson has played 26 times in his three seasons at Vale Park and is being tipped to make the most of his opportunity by Yates. "He's got all the attributes to play at the highest level," he said. Vale start their campaign with a trip to neighbours Crewe on Saturday, 8 August.